Marco Polo was a Venetian merchant who travelled to to court of Kublai Khan in the 13th century and wrote a famous account of his visit, that was long considered to be more or less either made up or based on other travellers' accounts, but his account was in later years proven to be factual and probably mostly based on first hand experience. The book itself as an object is lovely. It is bound in fabric that looks like bright red silk, is printed on heavy, luxurious paper, has a bound-in bookmark, and is richly decorated with photographs, reproductions of paintings and other art, and background graphics that enrich the text. The designers have taken the decision to let the main text stand for itself instead of cluttering the pages by competing text, so the extensive notes on the text are provided as endnotes rather than footnotes, and the captions and credits for the photos and artwork are to be found at the back of the book as well. It is a sumptuous book, what we Icelanders call an "eiguleg" book, i.e. it is worth owning as an object of beauty. This English version, which is an amalgamation of two of the most respected English translations, is quite readable, which brings me to the text itself, or rather its contents. 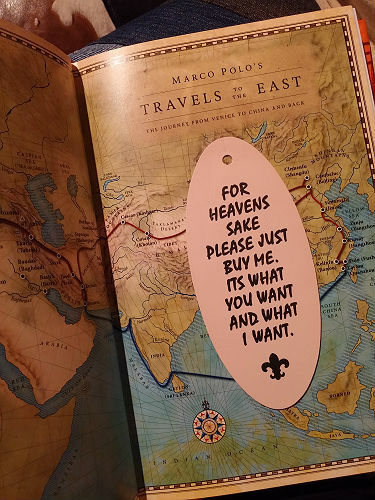 Anyone expecting thrills and high adventure from Marco Polo‘s Travels is bound to be disappointed. That said, if you don‘t come to it with any particular expectations, you might be pleasantly surprised. 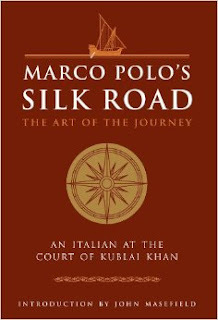 The actual travels are covered in a short prologue that tells of the journey, first of Marco‘s father and uncle and then the two of them and Marco, to the court of Kublai Khan and back. Little is said of their actual stay there. You can see a glimpse of the map under the bookmark here. The rest of this famous travel book is about the Khan and his court and about his dominion. The latter parts are comprised mostly of travel geography, i.e. how long it takes to travel between many places, with brief, often quite repetitive descriptions of the places and their peoples, their climates, geography, layouts and other interesting features, interspersed with occasional accounts of kings and nobles, dark deeds and noble ones, and especially how Kublai came to conquer this place or that. You may occasionally read about the hardships offered by a particular stretch of the route, but with no mention at all of any adventures or hardships that might have personally befallen the Polos themselves. It really reads more like a travel guidebook than a travel memoir and strikes me as a largely factual account. While Polo often gets dates and names mixed up and sometime exaggerates the greatness of this and that, there are not many tales of the kinds of improbable wonders often found in other travel accounts of the era. Since many of the places mentioned in the text have since acquired new names – sometimes several , one after the other – or have never been definitely identified, or may even have been wiped off the face of the earth by war or natural disasters, the extensive endnotes and the map between the prologue and the main text are necessary for the reader to get an idea of the area covered in the text, and the endnotes also supply explanations and clarifications of the names of people and of events and other things mentioned in the text. One would have to be very well-read indeed to supply all of that information out of one‘s own memory as one reads on. I found that the best way of reading main text and footnotes together was to lay the book on a table for reading and keeping one hand inside the footnotes for easy access, as I prefer to read notes as their reference numbers come up. You might choose to do it differently. I am definitely keeping this book, partly because it is a beautiful object, but also for reference. I am now planning to read Colin Thubron‘s Shadow of the Silk Road, as it covers part of the route taken by the Polos to China. It will be interesting to compare Polo‘s account with the modern situation. I suspect that although travel through the area would be considerably faster today than in Polo‘s time, some of the places he mentions would also be much more difficult and dangerous to get to in today‘s political climate than they were 800 years ago. I wouldn‘t mind reading (and owning) similar editions of The Travels of Sir John Mandeville and The Travels of Ibn Battutah. Finally, I wonder if there exists a good modern travelogue of the „in the footsteps of...“ kind, that traces Polo‘s actual routes and places of residence, rather than covering just part of it like Thubron‘s book. If you can recommend me such a book, I‘d be happy to hear about it. The Travels of Sir John de Mandeville were followed, in modern travelogue style, by Giles Milton, in his book "The Riddle and the Knight".